Day 6 of our Yellowstone Adventure found us at the most popular tourist attraction in the park: Old Faithful. Because most of Yellowstone is an active volcano (one of only about 35 in the world), molten rock lies just beneath the surface, causing geysers to shoot jets of water, mud pots to form, and fumaroles to hiss. To understand geysers, you first have to understand hot springs. As snow and rain seep through cracks in Earth’s crust, water seeps deep into the magma chambers located thousands of feet beneath the surface. The magma heats the water to more than 400 degrees Fahrenheit, causing it to rise and spring forth. Geysers form in the same way, but pressure buildup from narrow chambers causes the superheated water to erupt in a jetted plume high into the sky. Such is the case with Old Faithful, arguably the most well-known geyser on Earth, evidenced by the hundreds of people who gathered to await the next eruption. They were from all over the world, speaking an array of languages, as well as broken or heavily accented English. We arrived about a half-hour before the next predicted eruption, so we had the opportunity to watch the crowds swell and andticipation to build. Finally, after a few teasers, Old Faithful put on its show. We left the throngs and made our way to a beautifully constructed visitor and education center. 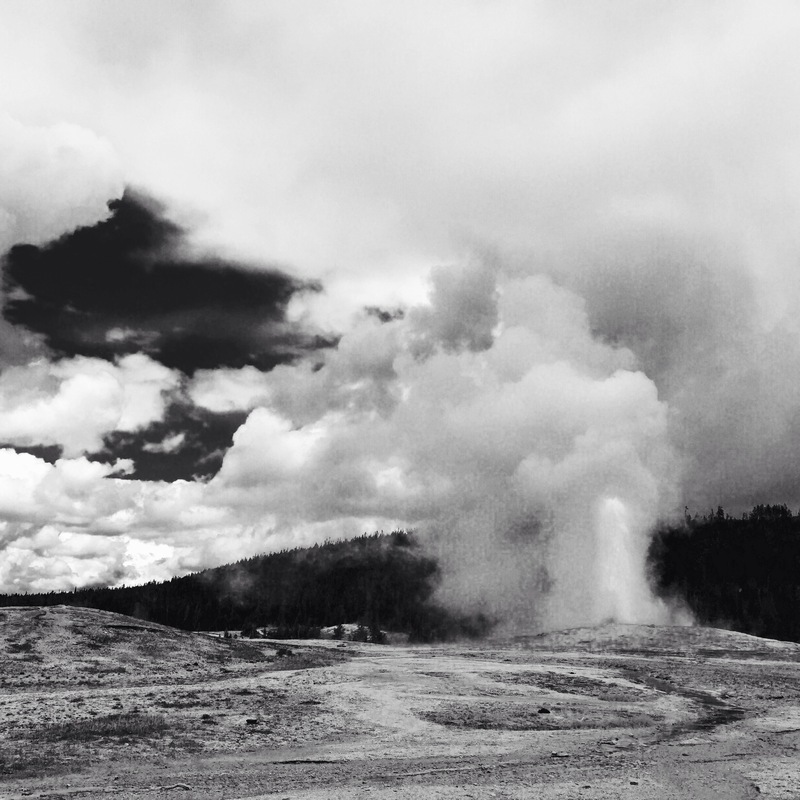 In fact, all of the Old Faithful area is a sight to behold. The entire area is anchored by the historic Old Faithful Inn, a rustic-style lodge with a log and wood shingle exterior that dates to 1904. The immense lobby and gigantic stone fireplace have welcomed guests for 110 years, so we felt we just had to step inside to take a few pictures of this grand hotel. En route to Old Faithful, we crossed the Continental Divide and passed several geyser basins, including Lower Geyser Basin, with its Fountain Paint Pots and other hydrothermal features. The mud pots there were thin and soupy, splashy and bubbly. The acidic pools were marvels of color and clarity. One particularly intriguing feature was Red Spouter, a reddish gurgling pool that resulted from a massive earthquake in 1959. The quake’s epicenter was 25 miles northwest of the site, but the jolt was felt throughout Yellowstone, causing this once grassy knoll to become Red Spouter. Although all these hydrothermal features look as though they couldn’t possibly support any form of life, they are all habitats for heat-loving microorganisms called “thermophiles.” These microorganisms live on gasses, such as hydrogen sulfide, and cause an odor like rotten eggs. It reminded us of our first stop of the day: Sulphur Cauldron, a muddy pool that is almost as acidic as battery acid. First, despite dire warnings to not walk on thermal areas because some pools are acidic enough to burn through boots and people have been scalded to death or badly burned and scarred, some people still insist on leaving the established walkway to get a selfie. A word to the wise: You can’t take a selfie from your coffin or urn. Second, it’s amazing how just one hour of Internet access can make us feel reconnected to the world. Well worth the $4.99. And sitting in the beautiful Snow Lodge while we checked in wasn’t bad, either. Third, if your child is throwing a fit and screaming loudly enough to alter the eruption of Old Faithful, it’s time to turn around and do something else. Clearly, he doesn’t want to see the geyser. May 29, 2015 in Adventures, Cloud 9, Destinations.